If you can’t stand the heat, get out of the orchard. I had such a good time listening to Griff and Audrey's story! 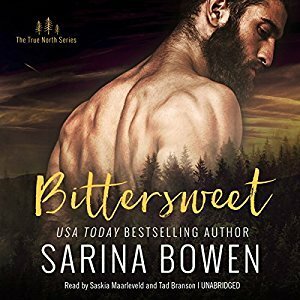 I recently discover Sarina Bowen's work when I listened to and fell in love with Bountiful. As soon as I finished that book, I knew that I was going to have to go back and listen to the rest of the series. As soon as I realized that this book was about Griff and Audrey, I almost jumped for joy since they were key characters in Bountiful. I went into this book with pretty high expectations and they were met. This really was a fantastic romance. I loved Griff and Audrey. Griff was a bit of a grump which I found completely adorable. I guess he had a few things to be grumpy about since he gave up his chance at football to come back home and run the family farm after his father's death. Farming is hard work and a lot to manage. He has taken on the responsibility of making sure that all of his family's needs are met. Audrey is passionate about cooking. She is a chef and has excellent skills. Unfortunately, her employer doesn't let her use those skills. Her current assignment is to visit farms in Vermont to get produce for the restaurants. She is determined to do what it takes to prove herself so that she can get her chance at running a kitchen. Griff and Audrey knew each other in college. It is obvious from their first meeting that they haven't forgotten each other even though their relationship was extremely brief. These two were perfect together from the very start of the book. I loved the way that Audrey just kind of fit into Griff's world even when he didn't think she would. Audrey didn't seem to mind Griff's grouch like behavior and seemed to really understand him from the start. They had fantastic chemistry and seemed so much better together than they were apart. This was the first time that I have listened to both Saskia Maarleveld and Tad Branson and I thought that they did a fantastic job with this audiobook. I do really enjoy romance novels that utilize dual narrators and thought their narration styles really worked well together. They were really both able to capture their character's personality and make them come alive. I think that they were able to bring a lot of emotion into the story as well. I would definitely listen to either of these narrators again in the future. I would highly recommend this book to fans of contemporary romance. This was a really well done story filled with characters that I grew to love over the course of the story. I had a really great time listening to Griff and Audrey find their happily ever after. I can't wait to experience more of this wonderful series very soon. I have no idea why I like grumpy ones, but I just do :D But bit of a grump is always better than full blown grump. Grumpy Heroes are the best! I don't think that she has any historical titles. She does have some m/m books though. I liked this one too. I wish I would have listened to it! I need to get to the rest of the series still. Great review! The narration was very well done with this one. I am so glad that I found this series. I love Sarina Bowen and can't wait to read this series! My favorite series of hers is The Ivy Years, but my favorite book is Brooklynaire. I think you will like it, Angie! I am planning to work my way through all of the audios available at the library over the next few months. I like the grump ones too. I'll have to keep this one in mind next time I'm in need of a romance. Griff was such a grouch at times...but I loved him. Griff sounds like my kinda guy, grumpy and all. :) These two do seem like they have a lot of chemistry, they just need to give in! Great review, this is one seires that I will be adding right nw. I loved this story as well. I haven't continued with the series, though. I'm well behind. Lol. I have really enjoyed both of her books that I have read. I am so in love with this series, and this book hit all the right notes for me. I love a second chance romance, and I fell in love with the Shipley family, as well as VT. I never expected to love a book about a farmer as much as I did. I wouldn't have expected to enjoy this one nearly as much as I did but it was just so well done. I did not know about this author. The story sounds lovely. I think that you would probably enjoy this one, Nadene! I haven't heard of these. Adding them now! Also, I find his beard to be incredibly attractive. Please tell me he also has a beard in the book?! I like the cover with the trees... they look like they're crawling up his arm. I'm always looking for amazing audiobooks, and this sounds absolutely perfect. Thanks! Yes, he has the beard in the book! She's so very good. I've only done dual once and it was with a male narrator I hate so didn't go quite so well. I need to give it another try! This duo was so good, Anna! I love dual narration and these narrators worked really well together. I had so much fun with this grumpy farmer!